Cities: Capital: Nassau, New Providence. Second-largest city — Freeport, Grand Bahama. Nationality: Noun and adjective — Bahamian(s). Population (2010 unofficial est. ): 353,658 including an estimated 30,000-60,000 undocumented Haitians. Annual population growth rate (2010 est. ): 1.24%. Religions: Baptist (35%), Roman Catholic, Anglican, Evangelical Protestants, Methodist, Church of God, Rastafarian, traditional African. Education (2010): Years compulsory: through age 16. Attendance — 92%. Literacy — 95.5%. Health (2010 est. ): Infant mortality rate — 16.1/1,000. Life expectancy — 73.15 years. Work force (2011): 190,075; majority employed in the tourism, government, and financial services sectors. Branches: Executive: Queen Elizabeth II (head of state), governor general (representative of Queen Elizabeth II), prime minister (head of government), and cabinet. Legislative — bicameral Parliament (38-member elected House of Assembly, 16-member appointed Senate). Judicial — Privy Council in U.K., Court of Appeal, Supreme Court, and magistrates' courts. Political parties: Free National Movement (FNM), Progressive Liberal Party (PLP), Bahamas Democratic Movement (BDM), National Development Party, Worker's Party. GDP (2010 est., official exchange rate): $7.702 billion (current); $7.617 billion (constant). Growth rate (2010 est. ): -1.35% (current); 0.95% (constant). Per capita GDP (2009 est. ): $21,538 (constant). Government spending (current expenditure only, 2010): 14.9% of GDP. Financial services: 11.3% of GDP. Business services and real estate: 17.7% of GDP. Construction (2010; 11.4% of GDP): Products — largely tourism-related. Manufacturing (2010; 3.3% of GDP): Products — plastics, pharmaceuticals, rum. Agriculture and fisheries (2010; 1.2% of GDP): Products — fruits, vegetables, lobster, fish. Trade (2009): Exports ($621 million): mineral products and salt, rum, animal products, chemicals, fruits, and vegetables. Export partners (2007) — U.S. (75.6%), U.K. (4.9%), Canada (3.7%), France (3.8%). Imports ($2.9 billion) — foodstuffs and animals, machinery and transport equipment, manufactures, chemicals, mineral fuels. Import partners (2007) — U.S. (83.8%), Puerto Rico (7.0%), Trinidad and Tobago (2.3%). Haitians form the largest immigrant community in The Bahamas. 30,000-60,000 are estimated to be resident legally or illegally, concentrated on New Providence, Abaco, and Eleuthera islands. School attendance is compulsory between the ages of 5 and 16. The government fully operates 157 of the 252 primary and secondary schools in The Bahamas. The other 95 schools are privately operated. Enrollment for state primary and secondary schools is 48,545, with more than 21,000 students attending private schools. The College of The Bahamas, established in Nassau in 1974, provides programs leading to bachelors and associates degrees. Several non-Bahamian colleges also offer higher education programs in The Bahamas. The late 1600s to the early 1700s were the golden age for pirates and privateers. Many famous pirates and privateers — including Sir Francis Drake and Blackbeard — used the islands of The Bahamas as a base. The numerous islands and islets with their complex shoals and channels provided excellent hiding places for the plundering ships near well-traveled shipping lanes. The first Royal Governor, Woodes Rogers, brought law and order to The Bahamas in 1718 when he expelled the buccaneers. The Bahamas is an independent member of the Commonwealth of Nations. It is a parliamentary democracy with regular elections. As a Commonwealth country, its political and legal traditions closely follow those of the United Kingdom. The Bahamas recognizes Queen Elizabeth II as its head of state, while an appointed Governor General serves as the Queen's representative in The Bahamas. A bicameral legislature enacts laws under the 1973 constitution. House of Assembly members are elected from individual constituencies for 5-year terms. In 2011, the number of seats was reduced from 41 to 38. As under the Westminster system, the government may dissolve the Parliament and call elections at any time. The House of Assembly performs all major legislative functions. The leader of the majority party serves as prime minister and head of government. The Cabinet consists of at least nine members, including the prime minister and ministers of executive departments. They answer politically to the House of Assembly. The Governor General appoints the Chief Justice of the Supreme Court on the advice of the Prime Minister and the Leader of the Opposition. The Governor General appoints the other justices with the advice of the Judicial and Legal Services Commission. The Privy Council of the United Kingdom is the highest Court for The Bahamas. The Court of Appeal is separate from the Supreme Court, comprised of a President, three resident Justices of Appeal and one non-resident Justice of Appeal. The Chief Justice is part of the Court of Appeal by virtue of his title as Head of Judiciary. Prior to 1967, the white-dominated United Bahamian Party (UBP) ruled The Bahamas, then a dependency of the United Kingdom, while a group of influential white merchants, known as the "Bay Street Boys," dominated the local economy. In 1953, Bahamians dissatisfied with UBP rule formed the opposition Progressive Liberal Party (PLP). Under the leadership of Lynden Pindling, the PLP won control of the government in 1967 and led The Bahamas to full independence in 1973. A coalition of PLP dissidents and former UBP members formed the Free National Movement (FNM) in 1971. Former PLP cabinet minister and member of Parliament Hubert Ingraham became leader of the FNM in 1990, upon the death of Sir Cecil Wallace-Whitfield. Under the leadership of Ingraham, the FNM won control of the government from the PLP in the August 1992 general elections. The PLP regained power in 2002 under the leadership of Perry Christie. The FNM, again led by Ingraham, returned to government by capturing 23 of the 41 seats in the House of Assembly during the May 2007 election; the PLP won 18 seats. In July 2008 Prime Minister Ingraham announced changes to ministerial portfolios and the creation of two additional ministries — the Ministry of Youth, Sports, and Culture and the Ministry of the Environment. The next general election must be held no later than May 2012. Prime Minister Ingraham has said he will run for his seat in 2012. Deputy Prime Minister and Minister of Foreign Affairs Brent Symonette announced in January 2012 that he will retire from politics after the 2012 election. The Bahamas maintains an embassy in the United States at 2220 Massachusetts Ave., NW, Washington, DC 20008 (tel: 202-319-2660) and Consulates General in New York at 231 East 46th Street, New York, NY 10017 (tel: 212-421-6420); in Miami at Suite 818, Ingraham Building, 25 SE Second Ave., Miami, FL 33131 (tel: 305-373-6295); and in Atlanta at 2970 Clairmont Road, Atlanta, GA 30329 (tel: 404-636-3911). The Bahamian economy is driven by tourism and financial services. Tourism and tourism-related construction and manufacturing provide an estimated 60% of the gross domestic product (GDP). Tourism directly and indirectly employs about half the Bahamian work force. In 2008, 4.6 million tourists visited The Bahamas, 85% from the United States. The number of visitors declined in 2009 due to the global economic crisis, but by December 2010, The Bahamas once again enjoyed 5 million visitors. This was a 4.5% year-on-year decrease from 2007. There are about 110 U.S.-affiliated businesses operating in The Bahamas, and most are associated with tourism and banking. With few domestic resources and little industry, The Bahamas imports nearly all its food and manufactured goods from the United States. American goods and services tend to be favored by Bahamians due to cultural similarities and heavy exposure to American advertising. The Bahamian economy, due to its heavy dependence on U.S. tourism and trade, is deeply affected by U.S. economic performance. The Bahamas has experienced an economic downturn as a result of the worldwide economic recession. Tourism numbers dropped significantly during the last quarter of 2008, and approximately 112,000 Bahamians were receiving unemployment benefits as of November 2009. The Bahamas is focusing on road works and other infrastructure projects in an effort to boost the economy and create employment. Future goals include continued development of tourism properties through large-scale private sector investment, including increased Bahamian ownership, redevelopment of the Grand Bahama economy following major hurricane losses in 2004, and the expansion of the robust Bahamian financial sector. In addition to the decrease in tourism, other economic challenges facing The Bahamas include meeting continued employment demands, jumpstarting a lagging privatization process, and monitoring increasing levels of government debt. Currently, Bahamians do not pay income or sales taxes. Most government revenue is derived from high tariffs and import fees. Reduction of trade barriers will probably require some form of taxation to replace revenues. Government as well as private sector leaders have voiced the need for a value added tax (VAT). The Bahamas is taking steps toward its goal of joining the World Trade Organization. In December 2008 the Bahamian Government signed an Economic Partnership Agreement (EPA) with the European Union (EU). A number of planned hotel projects have promised to increase economic growth and create short- and long-term employment. The Atlantis Resort and Casino on Paradise Island remains a major tourist draw and an engine of the economy; this resort is currently planning its "4th phase" of upgrades. In March 2009 the ExIm Bank of China formally agreed to $2.6 billion in financing for the major BahaMar resort project. Parliament also approved the contentious request for 8,150 mostly Chinese laborers to work on the project. The government is currently redeveloping Nassau's Lynden Pyndling International Airport and has turned over its management to private operators. The new U.S. arrivals and departures terminal at the airport was completed in March 2011. The Bahamian Government also has adopted a proactive approach to courting foreign investors and has conducted major investment missions to Asia, Europe, Latin America, India, and Canada. The government continues to pay particular attention to China to encourage tourism and investment. The Bahamas has opened an embassy in Beijing; the Chinese are funding the construction of a new $30 million sports stadium in New Providence and are providing more than $100 million in road construction projects. While the FNM government has expressed a desire to increase Bahamian ownership interests in developments, The Bahamas' dependence on foreign investment is unlikely to change. Financial services constitute the second-most important sector of the Bahamian economy, accounting for up to 11.3% of GDP, due to the country's status as a tax haven and offshore banking center. The Stop Tax Haven Abuse bill, which has been proposed in the U.S. Congress and which names The Bahamas as one of 34 secrecy jurisdictions, has generated considerable discussion in local media and amongst politicians. Many Bahamians feel the inclusion of The Bahamas in such a bill would result in significant job losses in the financial services sector. As of 2005, the government had licensed 262 banks and trust companies in The Bahamas. The Bahamas promulgated the International Business Companies (IBC) Act in January 1990 to enhance the country's status as a leading financial center. The act served to simplify and reduce the cost of incorporating offshore companies in The Bahamas. Within 9 years, more than 84,000 IBC-type companies had been established. In February 1991, the government also legalized the establishment of Asset Protection Trusts in The Bahamas. In 2000, in response to multilateral organizations' concerns, the government passed a legislative package of stronger measures to better regulate the financial sector and prevent money laundering in the country's banking sector, including creation of a Financial Intelligence Unit and enforcement of "know-your-customer" rules. Some of these measures have been challenged in Bahamian courts, and the number of offshore banks registered in The Bahamas has declined substantially since 2002. As many as half of the IBCs have also closed shop. The government is considering additional legislation to keep the industry competitive while complying with international standards, including possible reform of the regulatory structure. As of March 2010, The Bahamas had signed 20 bilateral Tax Information Exchange Agreements, 14 with Organization for Economic Cooperation and Development (OECD) members and seven with G-20 members. These agreements helped The Bahamas avoid placement on the OECD "gray" list of countries that are not compliant with OECD tax information exchange regulations. Agriculture and fisheries together account for about 1% of GDP. The Bahamas exports lobster and some fish but does not raise these items commercially. There is no large-scale agriculture, and most agricultural products are consumed domestically. Following an outbreak of citrus canker on Abaco in 2005, The Bahamas lost a main agricultural export, and the Ministry of Agriculture banned the export of plant materials from Abaco. The Bahamas imports more than $250 million in foodstuffs per year, representing about 80% of its food consumption. The Bahamian Government maintains the value of the Bahamian dollar on a par with the U.S. dollar. The Bahamas is a beneficiary of the U.S.-Caribbean Basin Trade Partnership Act (CBTPA), Canada's CARIBCAN program, and the EU's Economic Partnership Agreement. Although The Bahamas participates in the political aspects of the Caribbean Community (CARICOM), it has not entered into joint economic initiatives, like the CSME, with other Caribbean states. The Bahamas has a few notable industrial firms: the pharmaceutical firm PFC Bahamas (formerly Syntex); the BORCO oil facility, doing business as Vopak Terminal Bahamas; Sands Beer; and the Bahamian Brewery in Grand Bahama, all in Freeport; and the Commonwealth Brewery in Nassau, which produces Heineken, Guinness, and Kalik beers. Other industries include sun-dried sea salt in Great Inagua, a wet dock facility in Freeport for repair of cruise ships, and mining of aragonite — a type of limestone with several industrial uses — from the sea floor at Ocean Cay. The Hawksbill Creek Agreement established a duty-free zone in Freeport, The Bahamas' second-largest city, with a nearby industrial park to encourage foreign industrial investment. The Hong Kong-based firm Hutchison Whampoa operates the container port in Freeport. The Bahamian Parliament approved legislation in 1993 that extended most Freeport tax and duty exemptions through 2054. The Bahamas offers attractive features to the potential investor: a stable democratic environment, relief from personal and corporate income taxes, timely repatriation of corporate profits, proximity to the United States with extensive air and telecommunications links, and a good pool of skilled professional workers. The Government of The Bahamas welcomes foreign investment in tourism and banking and has declared an interest in alternative energy, agricultural, and industrial investments to generate local employment, particularly in white-collar or skilled jobs. Despite its interest in foreign investment to diversify the economy, the Bahamian Government responds to local concerns about foreign competition and tends to protect Bahamian business and labor interests. As a result of domestic resistance to foreign investment and high labor costs, growth can stagnate in sectors which the government wishes to diversify. The country's infrastructure is best developed in the principal cities of Nassau and Freeport, where there are relatively good paved roads and international airports. Electricity is generally reliable, although many businesses have their own backup generators. In Nassau, there are two daily newspapers, several weeklies, and international newspapers available for sale. There also are six radio stations. 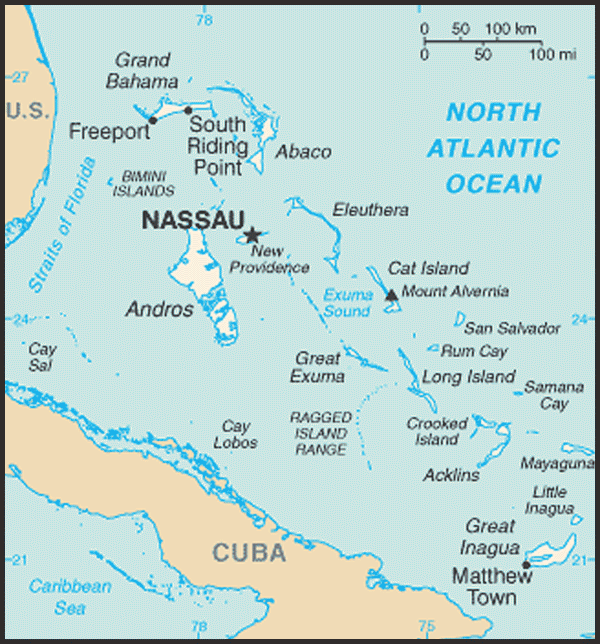 Both Nassau and Freeport have a television station. Cable TV and satellite also are available locally and provide most American programs with some Canadian and European channels. The Bahamas has strong bilateral relationships with the United States and the United Kingdom, represented by an ambassador in Washington and High Commissioner in London. The Bahamas also associates closely with other nations of the Caribbean Community (CARICOM). The Bahamas has an ambassador to Haiti and works closely with the United States and CARICOM on political and migration issues related to Haiti. The Bahamas has diplomatic relations with Cuba, including embassies in each other's capitals. A repatriation agreement was signed with Cuba in 1996, and there are commercial and cultural contacts between the two countries. The Bahamas also enjoys a strengthening relationship with China. 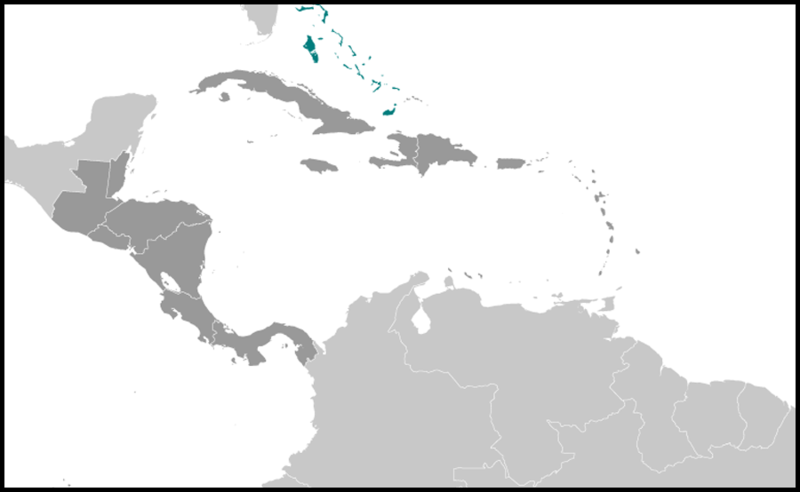 The Commonwealth of The Bahamas became a member of the United Nations in 1973 and the Organization of American States in 1982. The United States historically has had close economic and commercial relations with The Bahamas. The countries share ethnic and cultural ties, especially in education, and The Bahamas is home to approximately 30,000 American residents. In addition, there are about 110 U.S.-related businesses in The Bahamas and, in 2008, 85% of the 4.6 million tourists visiting the country were American. As a neighbor, The Bahamas and its political stability are especially important to the United States. The U.S. and the Bahamian Government have worked together on reducing crime and addressing migration issues. With the closest island only 45 miles from the coast of Florida, The Bahamas often is used as a gateway for drugs and illegal aliens bound for the United States. The United States and The Bahamas cooperate closely to handle these threats. U.S. assistance and resources have been essential to Bahamian efforts to mitigate the persistent flow of illegal narcotics and migrants through the archipelago. The United States and The Bahamas also actively cooperate on law enforcement, civil aviation, marine research, meteorology, and agricultural issues. The U.S. Navy operates an underwater research facility on Andros Island. The Department of Homeland Security's Bureau of Customs and Border Protection maintains "preclearance" facilities at the airports in Nassau and Freeport. Travelers to the U.S. are interviewed and inspected before departure, allowing faster connection times in the U.S. The U.S. Embassy (http://nassau.usembassy.gov/) is located at 42 Queen Street, Nassau (tel. 242-322-1181; telex 20-138); the local postal address is P.O. Box N-8197, Nassau, The Bahamas.